Human cells commit to apoptosis via the activities of the Bcl-2 proteins Bax and Bak. Consequently, Bax and Bak are regulated by a complex network of interactions with Bcl-2 proteins and other interaction partners. Bcl-2 proteins are grouped into prosurvival Bcl-2 proteins harboring four Bcl-2 homology domains (BH1-4, e.g. Bcl-2, Bcl-xL or Mcl-1) and proapoptotic Bcl-2 proteins with three BH domains (BH1-3, e.g. Bax or Bak). Proteins of both groups are structurally similar and contain a C-terminal transmembrane domain (TMD) mediating mitochondria-association to different extents. Prosurvival and proapoptotic Bcl-2 proteins are regulated by a diverse group of proteins sharing only the BH3 domain with Bcl-2 (BH3-only proteins). In response to stress, BH3-only protein signaling is thought to activate Bax and Bak, which in turn permeabilize the outer mitochondrial membrane and release cytochrome c (cyt c) and other intermembrane space proteins into the cytosol (mitochondrial outer membrane permeabilization, MOMP). Cytosolic cyt c results in mitochondrial dysfunction and initiates the caspase cascade that efficiently dismantles the cell. In healthy cells the pro-apoptotic activity of Bax is controlled by retrotranslocation of mitochondrial Bax back into the cytosol, counteracting constantly translocation of cytosolic Bax to the mitochondria (Fig. 1). 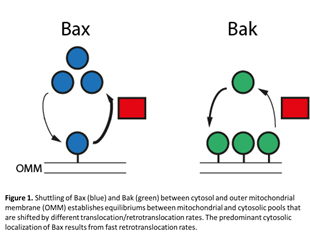 Permanent translocation and retrotranslocation of Bax establishes an equilibrium between cytosolic and mitochondrial Bax pools. Tethering secondary structure elements of Bax demonstrated the involvement of major conformational changes in Bax retrotranslocation. The functionally redundant but largely mitochondrial Bak is also regulated by Bcl-2 protein-dependent retrotranslocation. Differences in the cellular localizations of Bax and Bak arise from different shuttling rates caused by the hydrophobicity of both membrane anchors ( Fig. 1). Strikingly, BH3-only proteins reduce the rate of Bax retrotranslocation (Edlich et al., 2011), suggesting a reflection of the Bcl-2 protein signaling on the mitochondria (and ‘mitochondrial priming’) and perhaps other factors in the equilibrium between cytosolic and mitochondrial Bax. Currently, we evaluate the potential of Bax/Bak retrotranslocation as predictive marker in chemotherapy, explore the mechanism of Bax retrotranslocation, identify proteins involved in the cellular decision to commit to apoptosis and analyze alternative mechanisms of Bax regulation.